Last scene with Fish and the new prisoner was a gut-punch. Sadly -- and you guys know I unironically love this show -- not Gotham's finest hour. I'm not completely sure why it didn't work better. The elements were there. It may be that there were too many elements. Setting out to cram Fish's kidnapped-by-pirates (???) storyline into the same episode as the Scarecrow 1.0 (which really should have been a bigger story) and the Penguin's situation with Maroni and Falcone and Bruce's walk in the woods and ...I mean, I admire the ambition and love that nothing gets dragged out, but trying to do this much in an hour meant stuff that required more attention got short shrift. 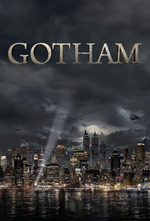 The best episodes of Gotham aren't afraid to concentrate the lion's share of their runtime on one or two storylines. I really can't get past that they had Julian Sands (!) as the Scarecrow (!!) and didn't do more. It wasn't a bad episode, but it was not all it could have been. Science nitpick: the point of a centrifuge is to separate things. If you take a tube out of a centrifuge and it all looks the same, you've done it wrong. That scene just confused me. Were we supposed to recognize the prisoner, or have some greater understanding of what happened to her? I didn't get it. Fish's whole subplot in this episode was weird -- last week we see her about to go toe-to-toe with the hijacker pirate guy, and this week she's suddenly in a dungeon in some indistinct location. Where are they? Is this in Gotham? Who's holding them prisoner? Is it the hijackers? What are they being held for? Although there's literally dozens of characters standing around, all ready and waiting to give us some plot exposition, the show is far more concerned with Fish's dull power-play on Mace than in letting us in on the actual plot. I really can't get past that they had Julian Sands (!) as the Scarecrow (!!) and didn't do more. Yeah, that was a shame. Sands is such a menacing presence, and they just... shoot him? And he doesn't get more powerful than they can imagine or anything, he just falls over? Bah. Really was. Fish is probably my favorite character on the whole show, but that whole thing was boring, cliche and nonsensical. There's no indication of who wants to keep her alive or why - this doesn't read like Falcone at all. Also, Mace wasn't the least bit threatening. He could've had a good story about why he was in charge, or might have at least stood up. On the fun side: I did like the stuff with Bruce and Alfred. Also, I'm still very curious to see where they're going with Jim and Dr. Thompkins.